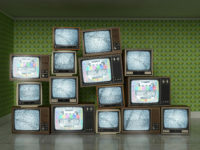 As more and more consumers give up their old bulky televisions and computer monitors for newer, sleeker, flat-panel replacements, more and more of these devices are discarded. The bulky TVs and monitors are commonly called CRTs for the “cathode ray tube” technology inside. These older devices are heavy because a thick layer of leaded glass protects users from X-ray emissions. The layer of glass is also highly shatter resistant. At one time, leaded glass from old monitors and TVs could be recycled to create new glass for replacement devices. However, as the marketplace has moved toward lightweight, thin screens, the demand for old leaded glass has disappeared. As a result, the costs for safely disposing of CRTs through electronics recycling programs have increased. According to an article last June in Carlisle, PA’s newspaper, The Sentinel, there are no longer locations for CRT TV recycling in the county, although Pennsylania state law mandates electronics recycling. A request for proposals to provide recycling for this material yeilded a proposed plan that would cost the county 40 cents per pound for televisions. At this fee, each TV could cost around $20 to recycle. This was not a viable option for the county. While some communities continue to accept CRTs for recycling, the changing economies of CRT recycling may result in higher fees in the future, or as in Cumberland County, PA, no options for local recycling of the material. If you have an old CRT television or computer monitor hanging around and your community still has recycling options, now would be a good time to recycle them!